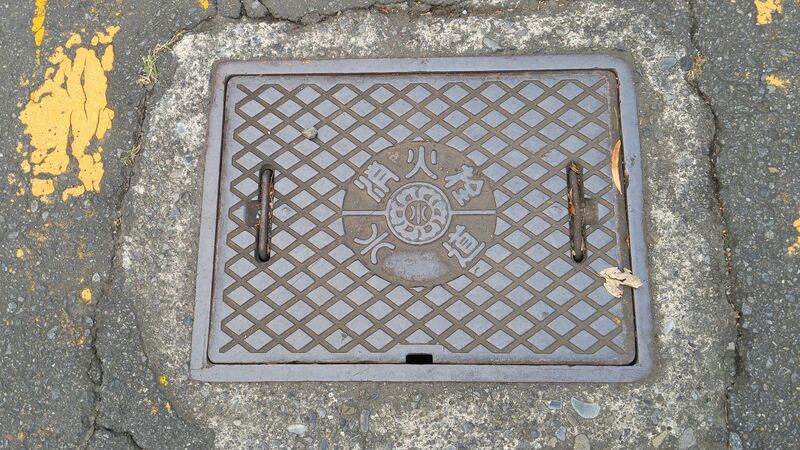 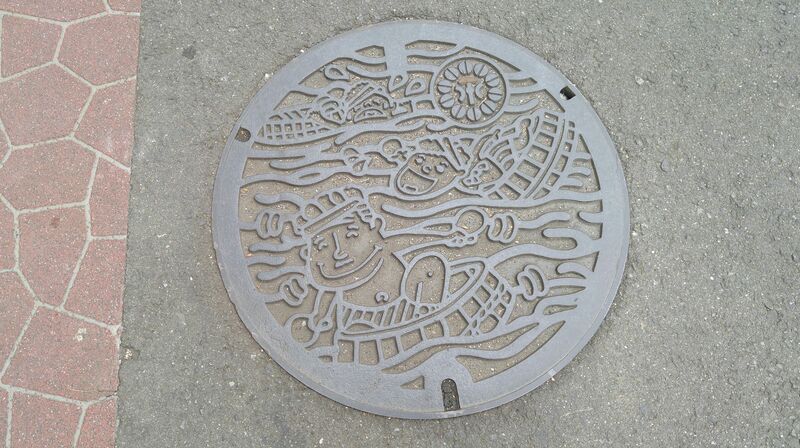 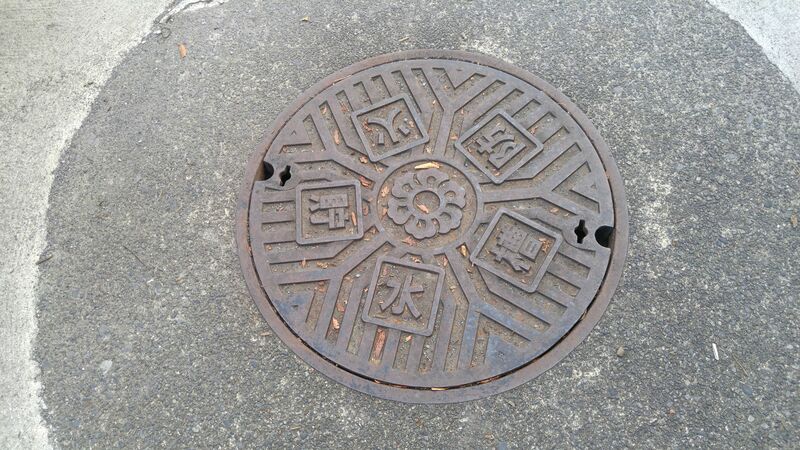 Manhole Covers in Shizuoka Prefecture 46: “new” and “old” discoveries in Hamamatsu City! 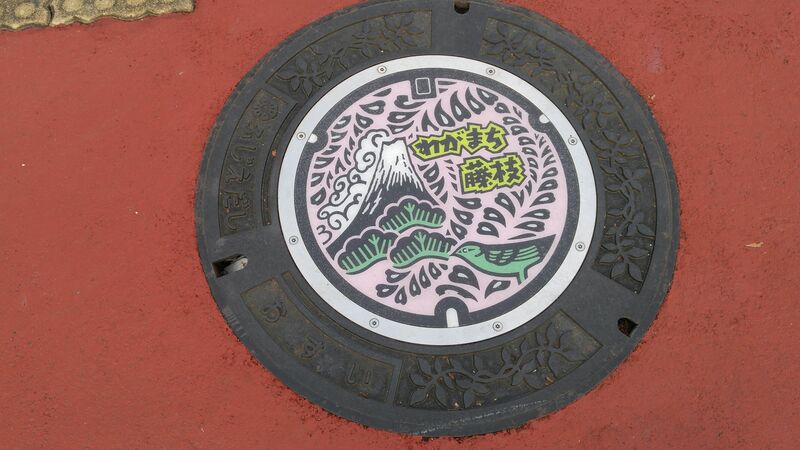 The other day I had the opportunity to visit Hamamatsu City for the first time in a long time and discovered and re-discovered manhole covers! 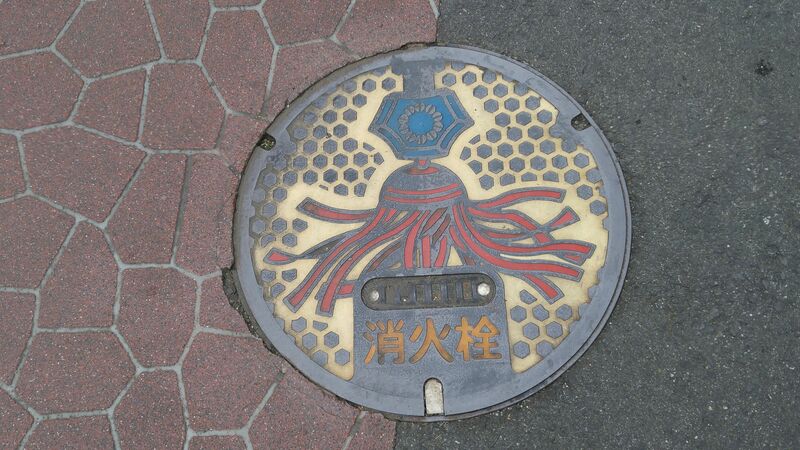 The one above is a new one for access to sewers with the mascot of Hamamatsu City, “Ieyasu Kun”, That is Lord Tokugawa Ieyasu that the City of Hamamatsu more or less stole (like they do with other things…) from Shizuoka City. 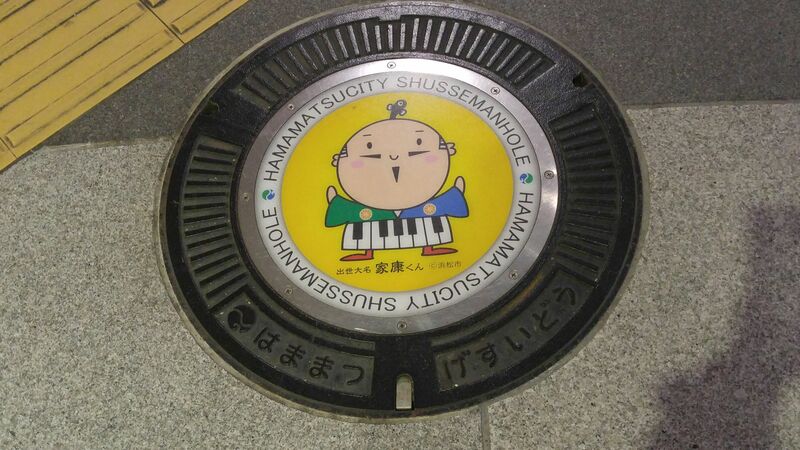 They added a piano to his apron because Hamamatsu City is the biggest piano producer in Shizuoka Prefecture. 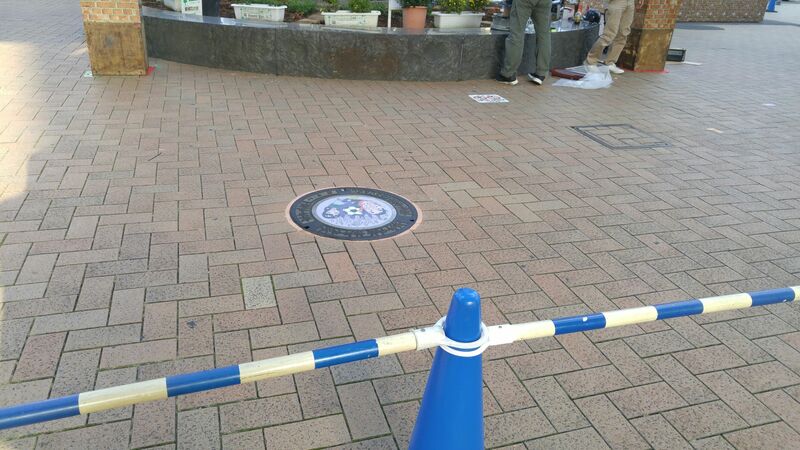 In the end (to make sure that they don’t copy Shizuoka City?) 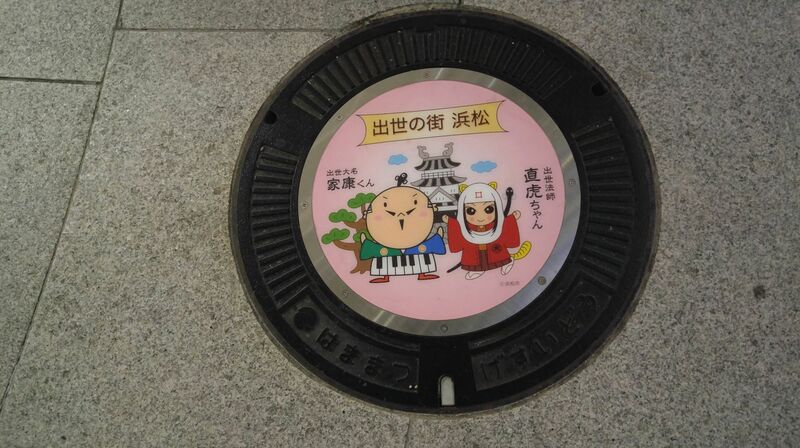 a new cover was created to give Ieyasu Kun a female companion called “Nattora Chan”1 And they also made a point that they too have a castle…. 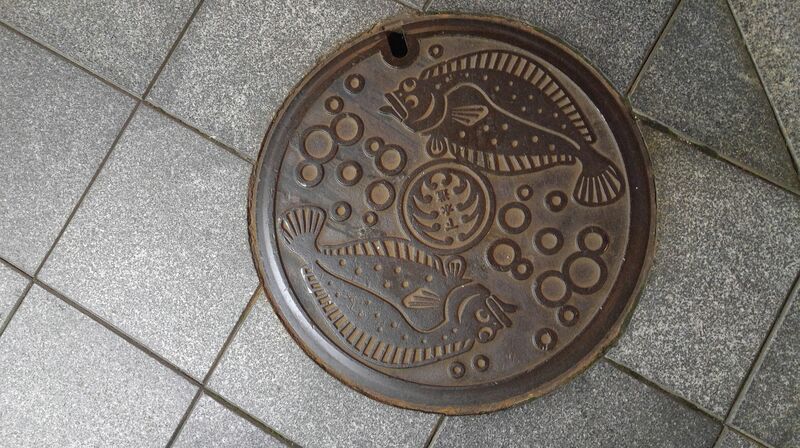 More interestingly, when I visited the old district of “Sakana Cho” I discovered, or more aptly said re-discovered old covers bearing fish (which is also pronounced “sakana” in Japanese!). 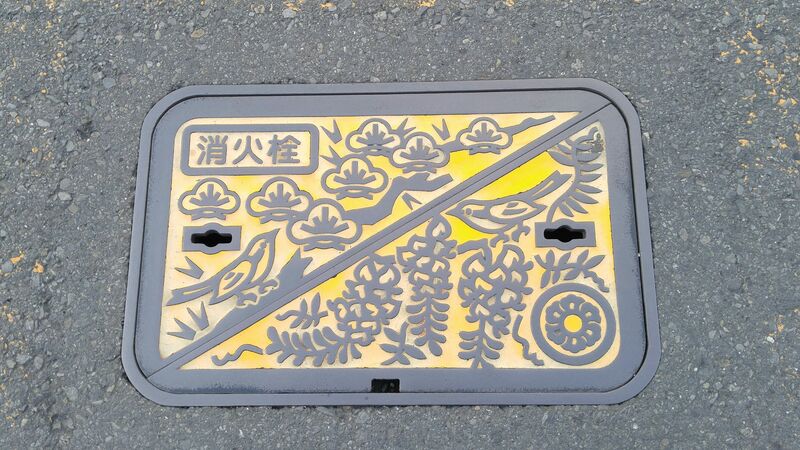 The one above represents two flat fish/soles/halibuts. 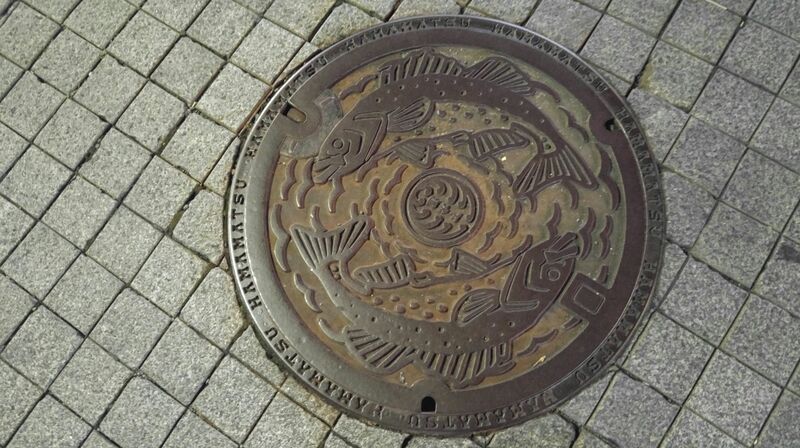 The two fish on that other one are cods, but I’m not too sure! 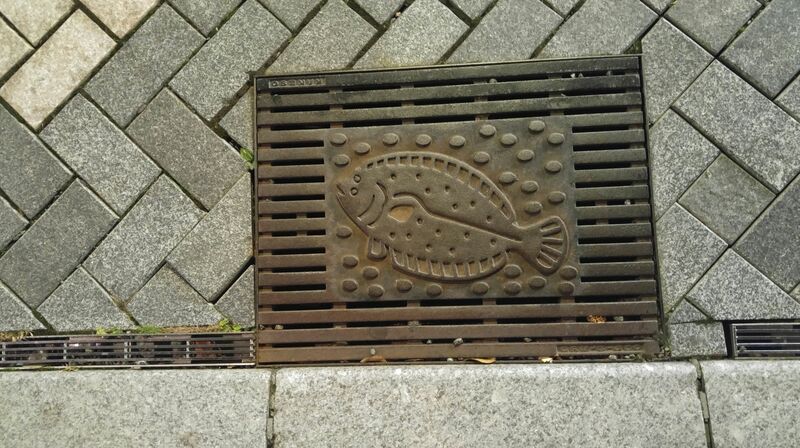 On this one, not a manhole cover, but a sewer plaque, the fish is definitely what the British call a “plaice”! 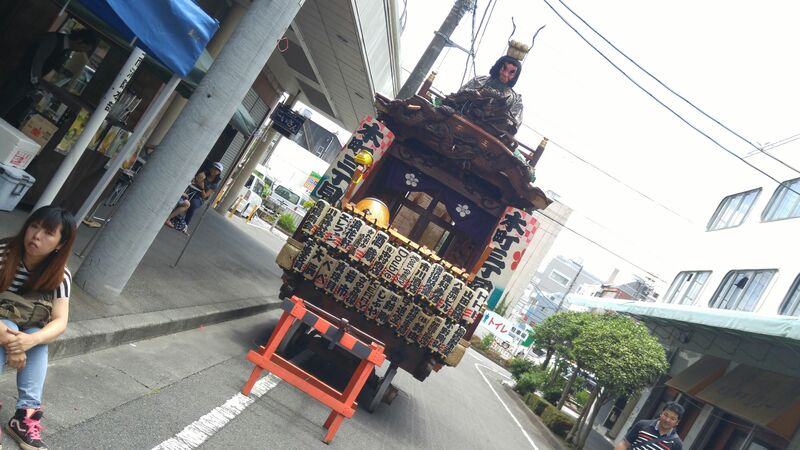 Footnote: Many cities, towns and villages having been recently merged into Hamamatsu City but I keep such reports according to separate areas of this area-wise vast city! 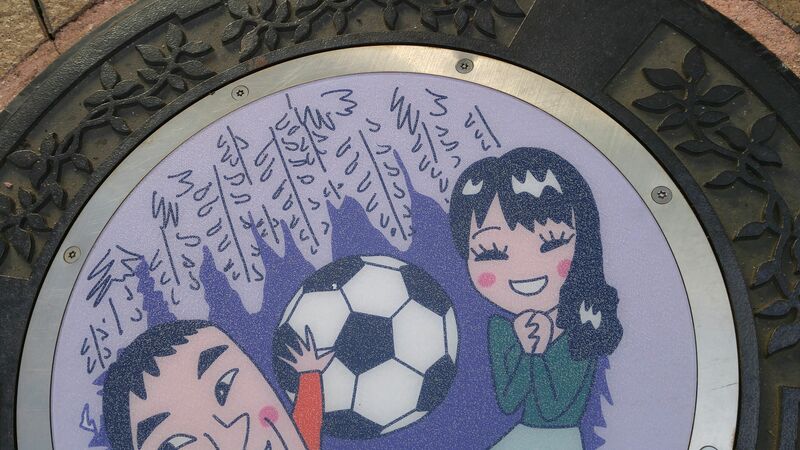 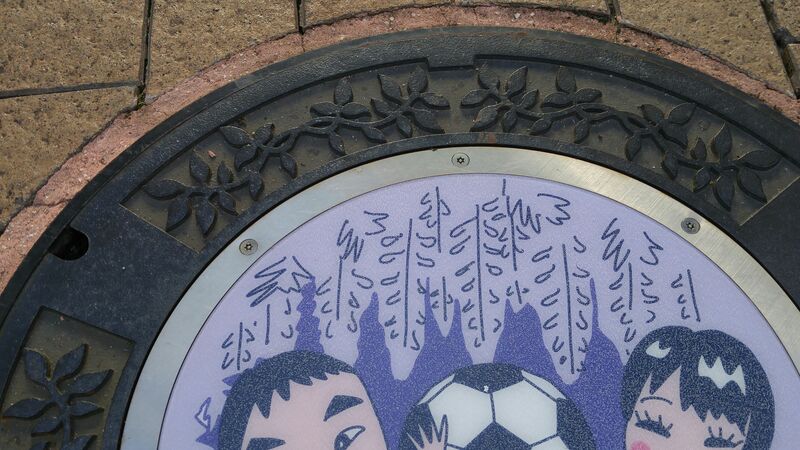 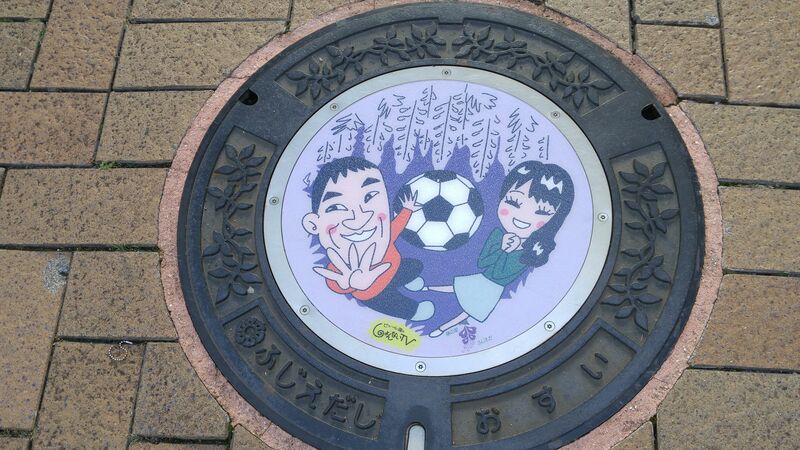 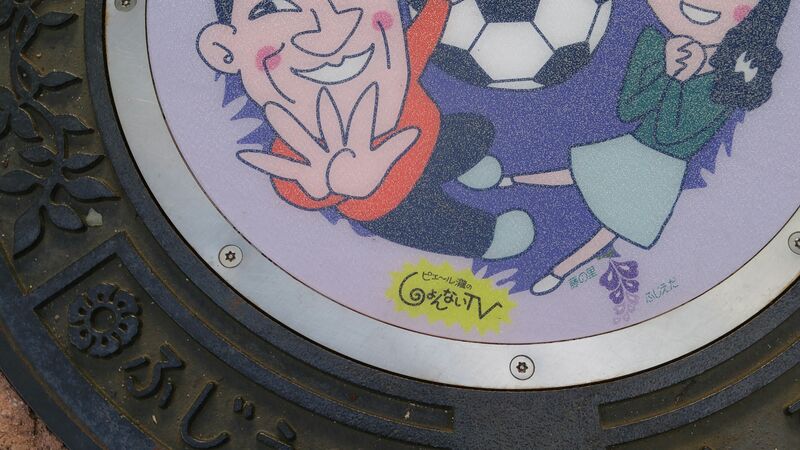 Manhole Covers in Shizuoka Prefecture 45: Ito City! 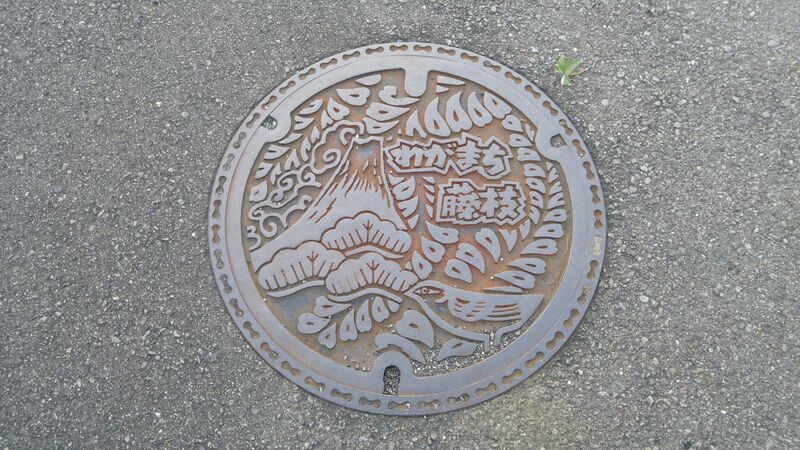 Ito City is a bit isolated at the eastern extremity of Shizuoka Prefecture just south of Atami City. 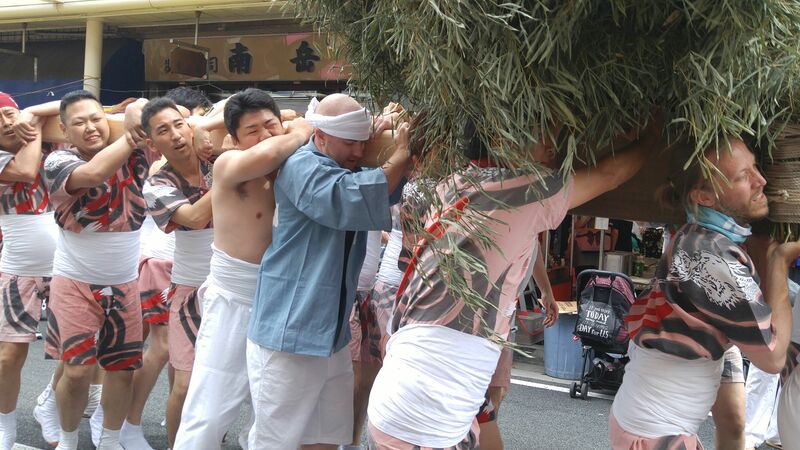 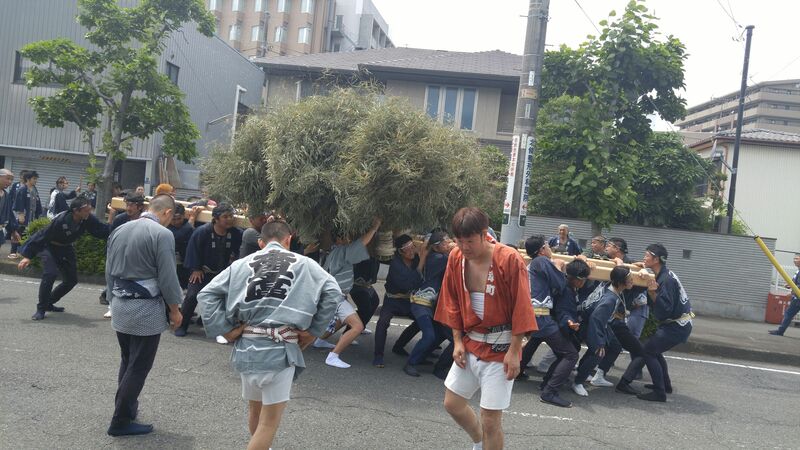 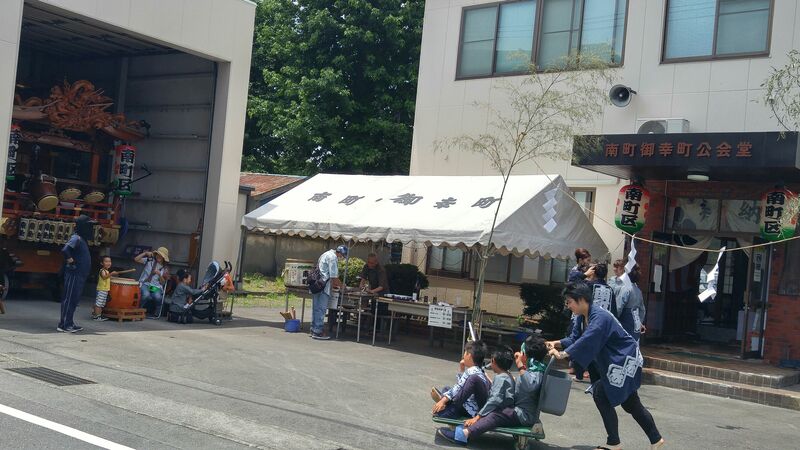 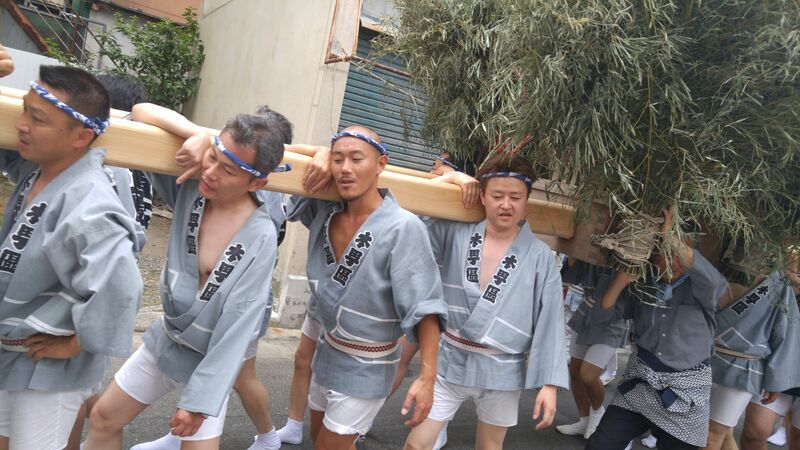 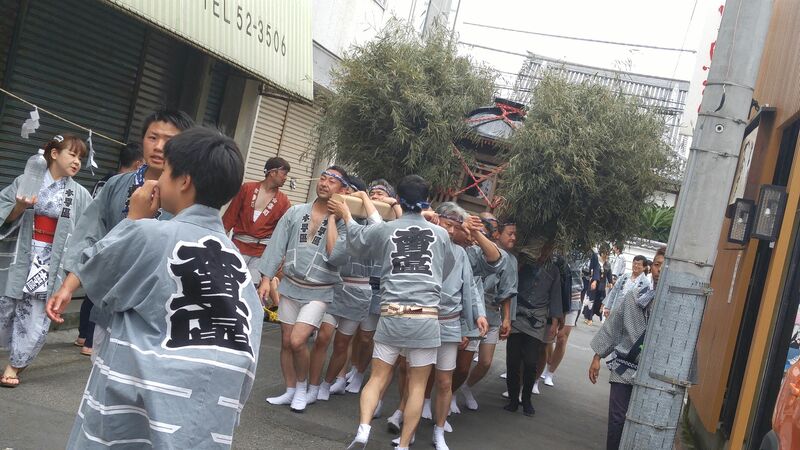 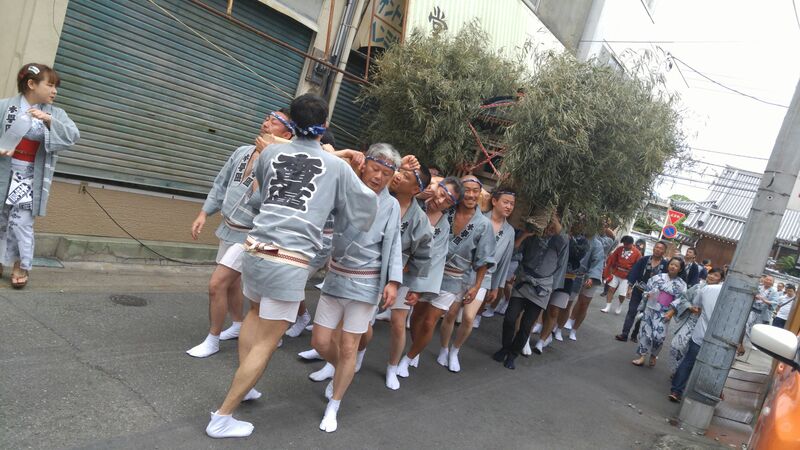 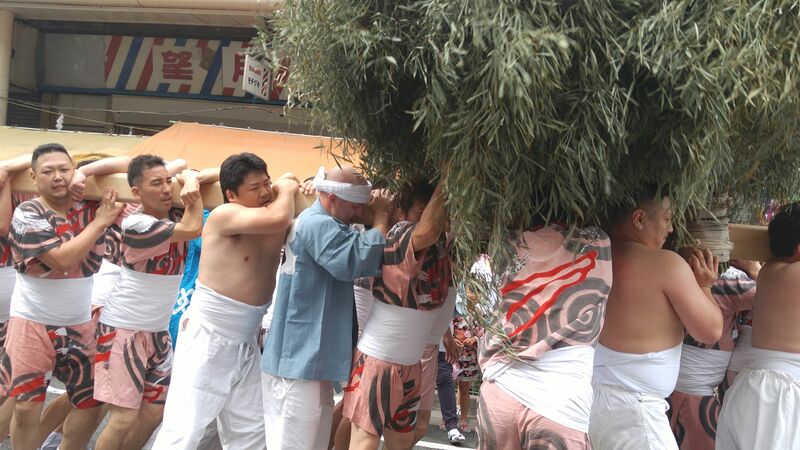 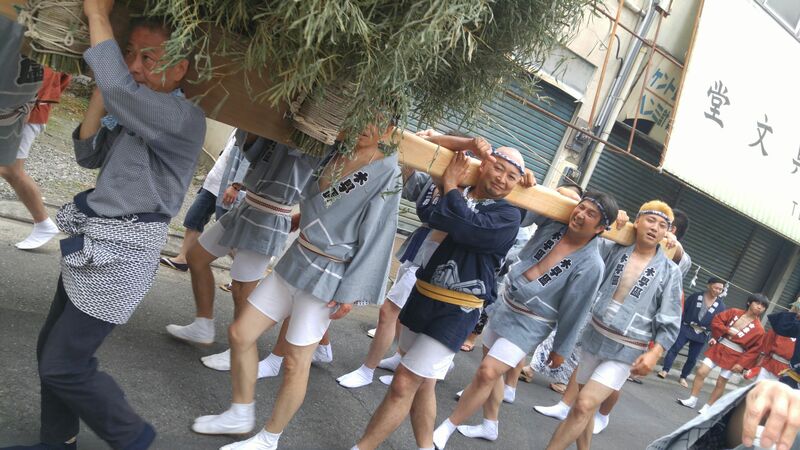 More “outsiders” than tourists from Shizuoka Prefecture tend to crowd its narrow streets. 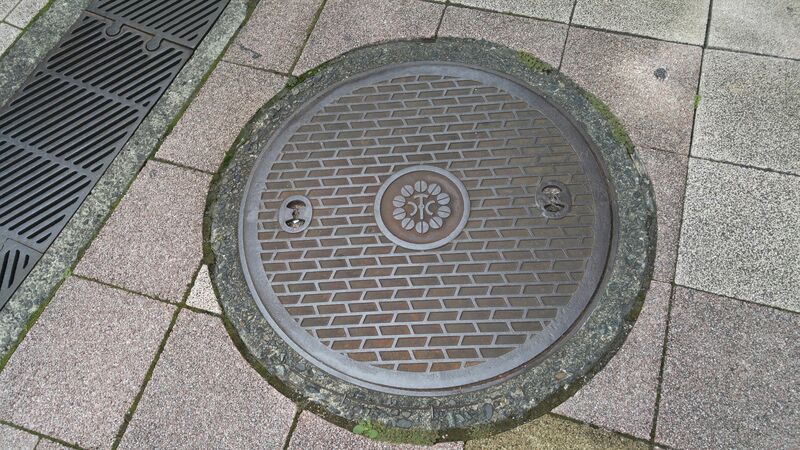 It is a quaint city full of hidden sights and one of them lies at your feet, namely manhole covers! 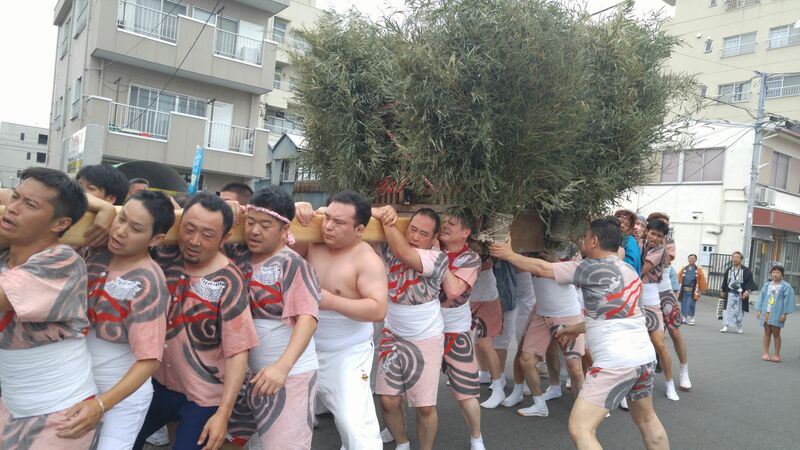 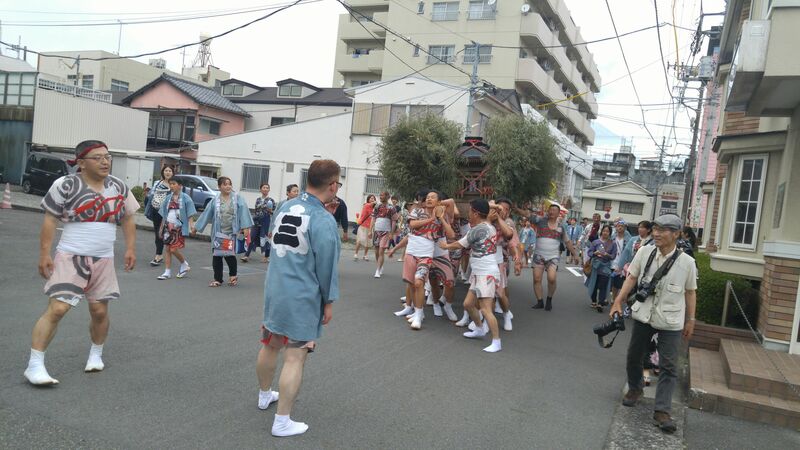 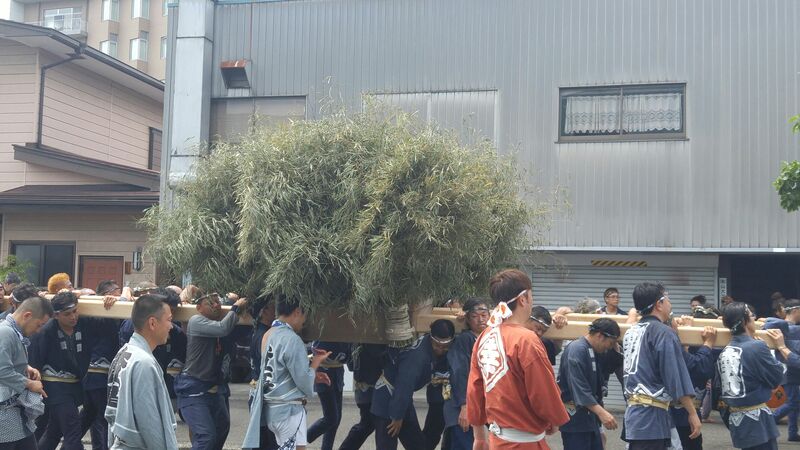 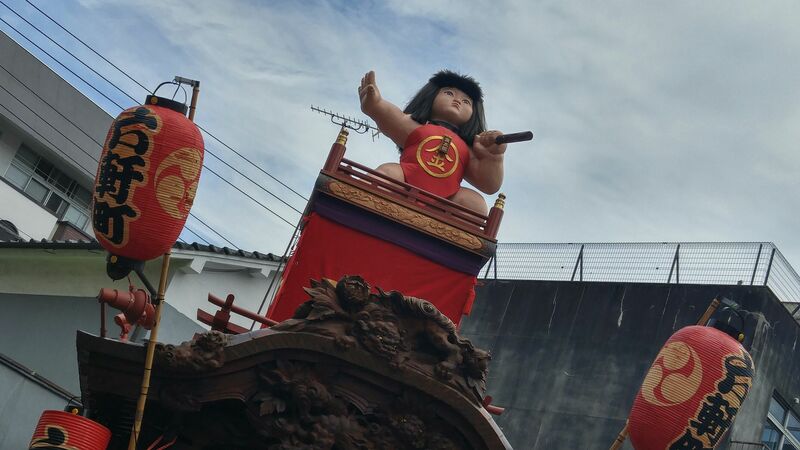 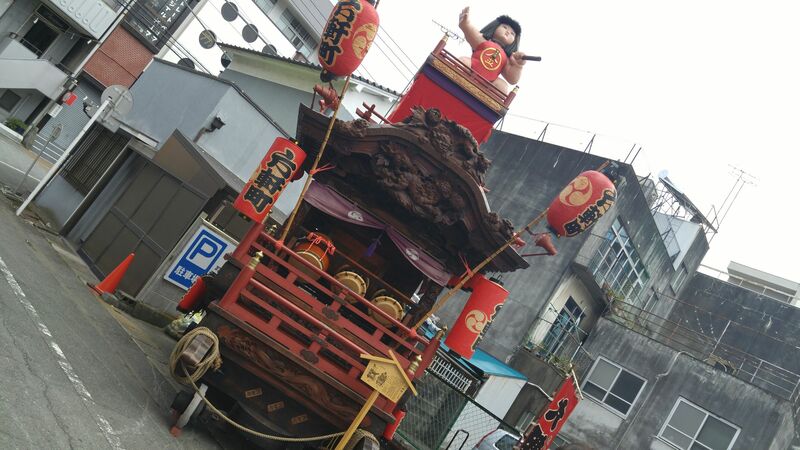 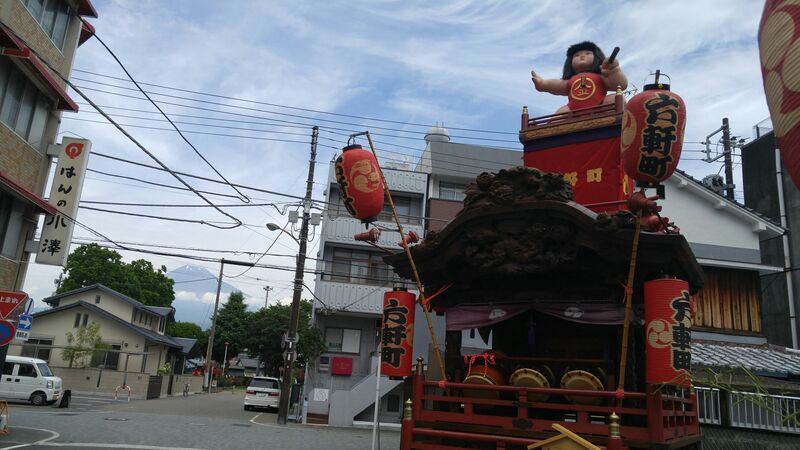 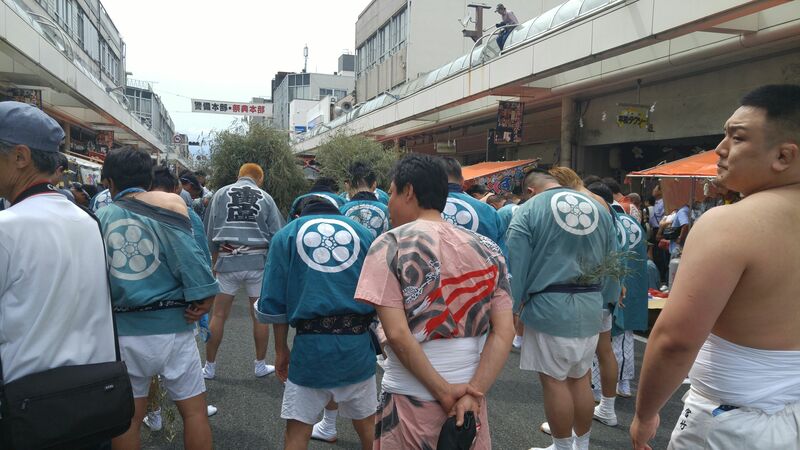 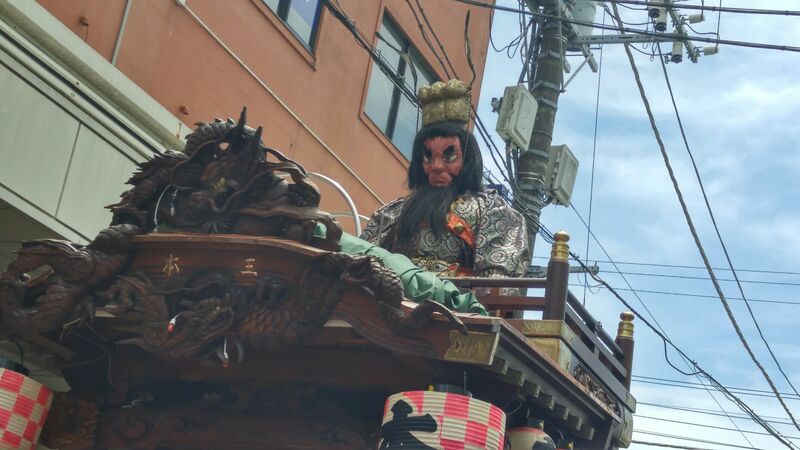 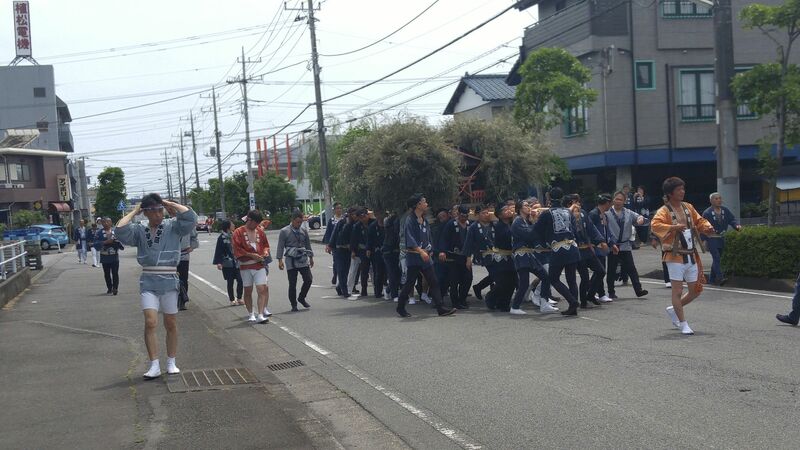 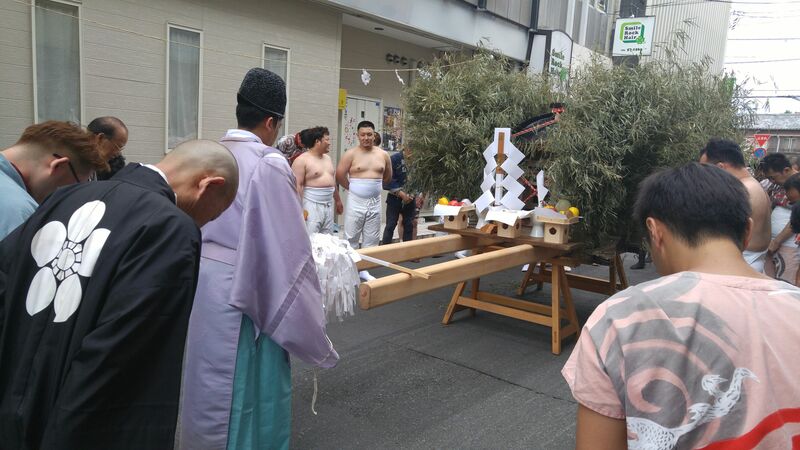 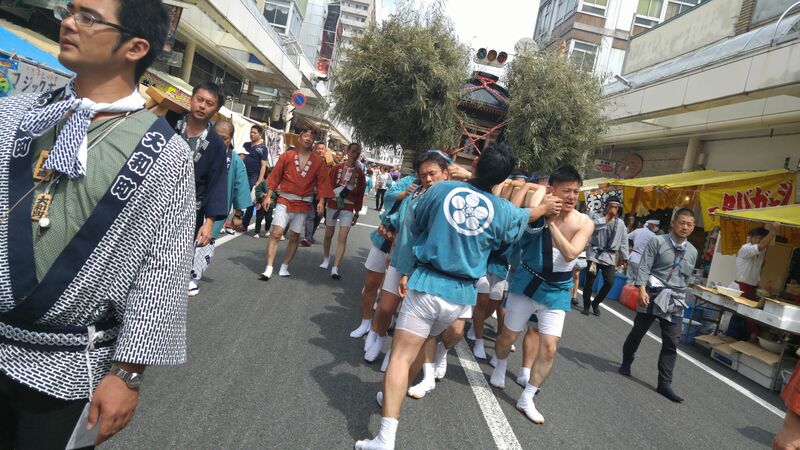 The first you will feet is that of a colorful rendition of a “matoi”/firefighters festival pole, which reminds you of the importance of keeping a vigilant eye all year round as fires were and still are the scourge of Japanese cities! 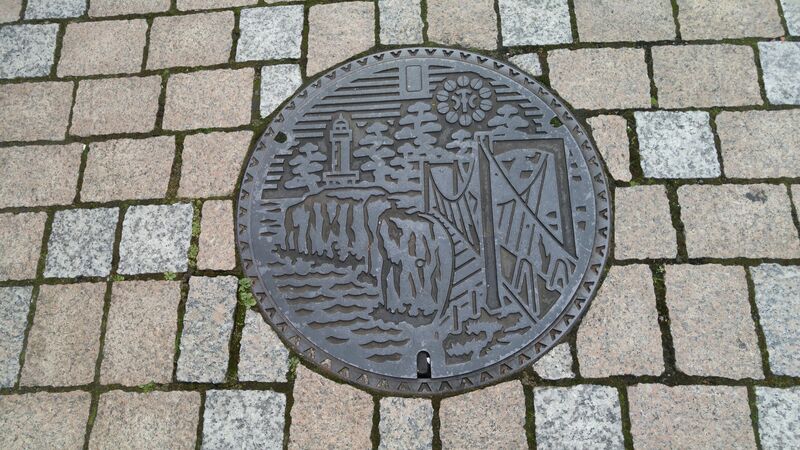 Cito City has two distinct “official” manhole cover designs, one showing the rugged shore, its light house and a suspended bridge over the sea! 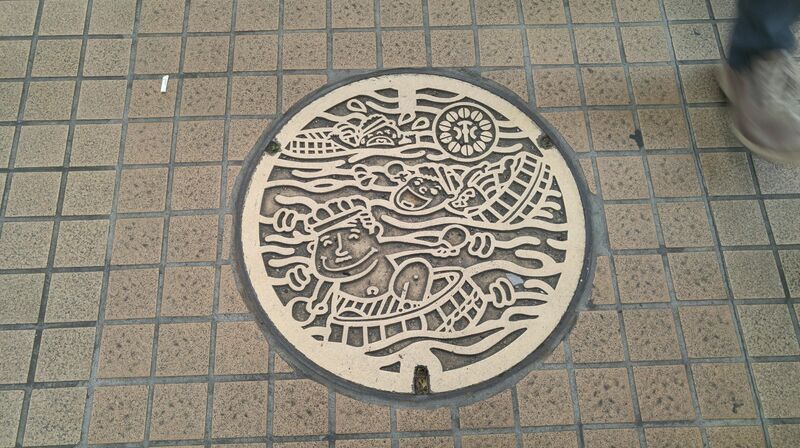 The other one is a rendition of the famous tub race festival being held every summer down the local river! 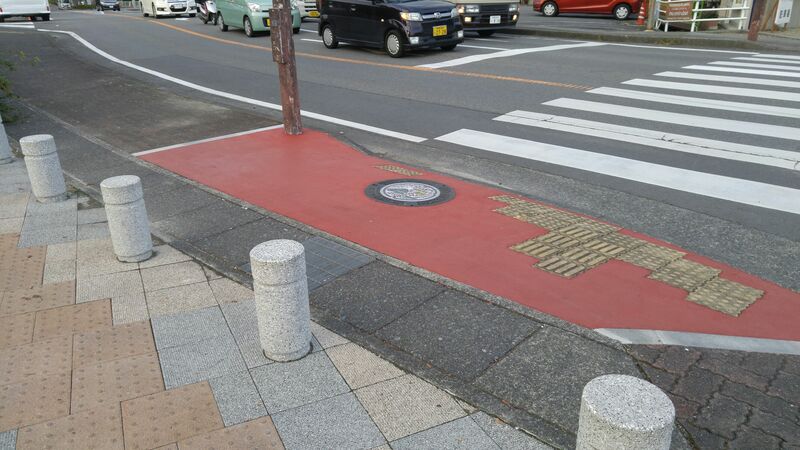 Some local citizens went as far as painting some for better a better exposure! 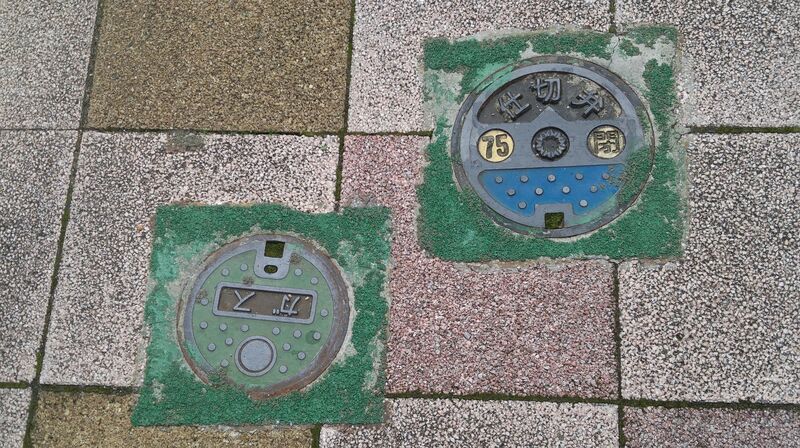 Note the official Ito City design on plainer covers! 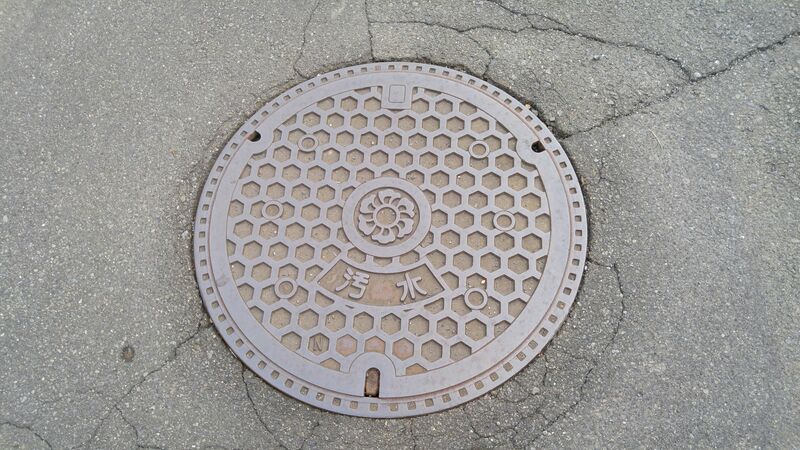 And if you look carefully, you will find plenty more covering all the valves needed for a city famous for its hot springs! 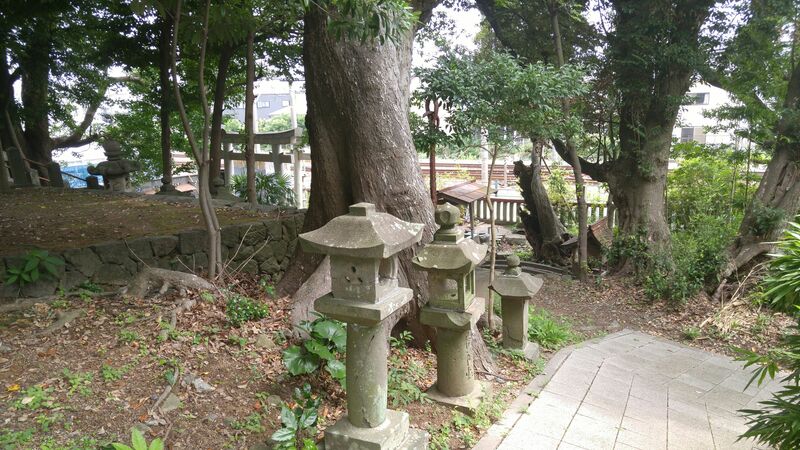 Sengen Shrine (浅間神社) and Kumano Shrine (熊野神社) in Mochimune, Shizuoka City! 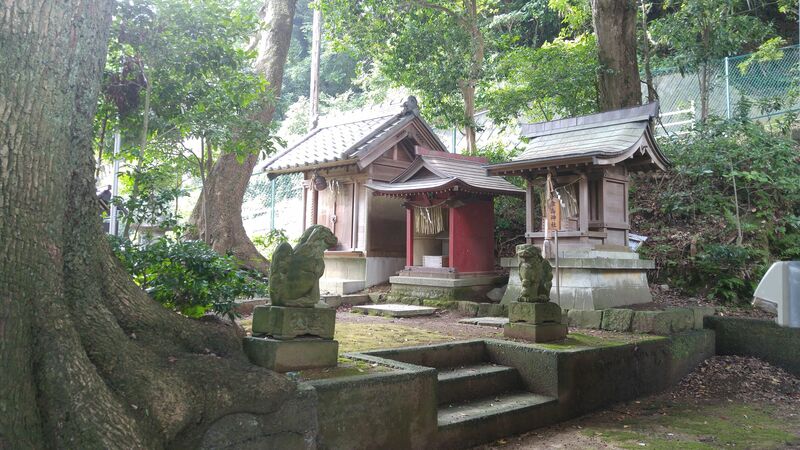 Sengen Shrine/浅間神社 and Kumano Shrine/熊野神社 were ercted in Mochimune, Shizuoka City at a time when the ocean/sea reached the slopes bordering the JR Railway Line. 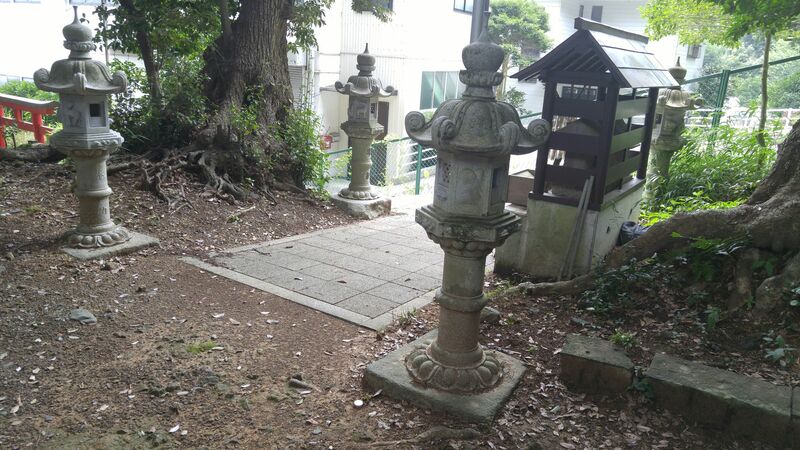 Now you have to find a way across the same railway line to be able to reach them in Shiroyama Cho! 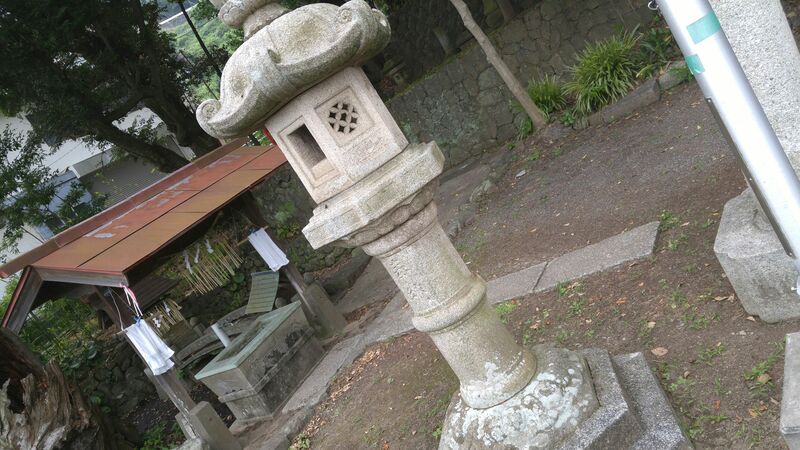 Once past the fairly modern concrete “torii”/sacred gates you will encounter the first stone lanterns/”ishidoroo”! 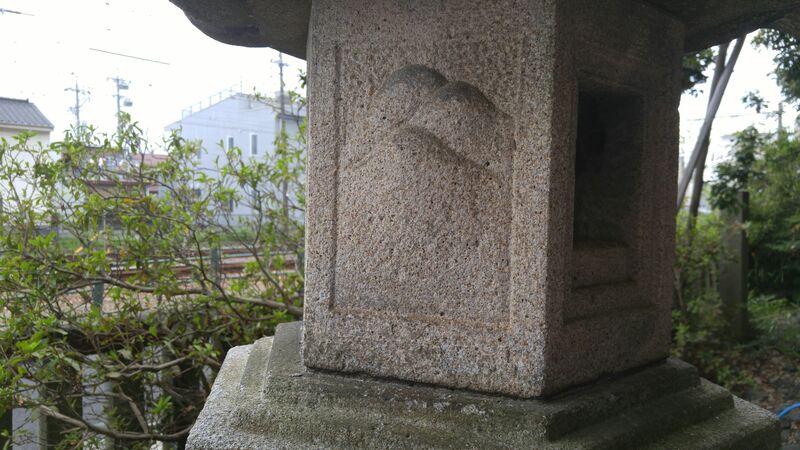 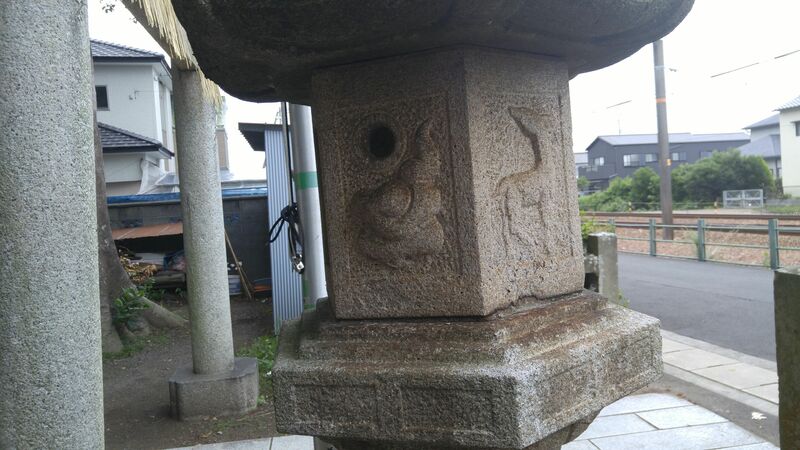 The stone lanterns bear the common carvings of clouds and deer. 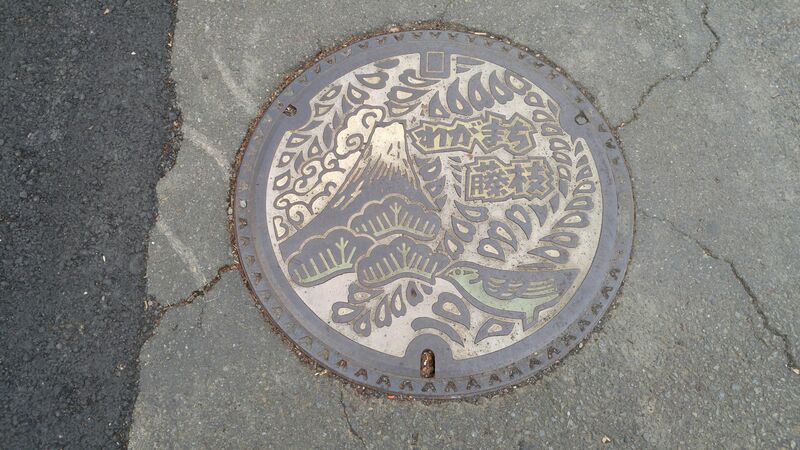 As well as that of mountains! 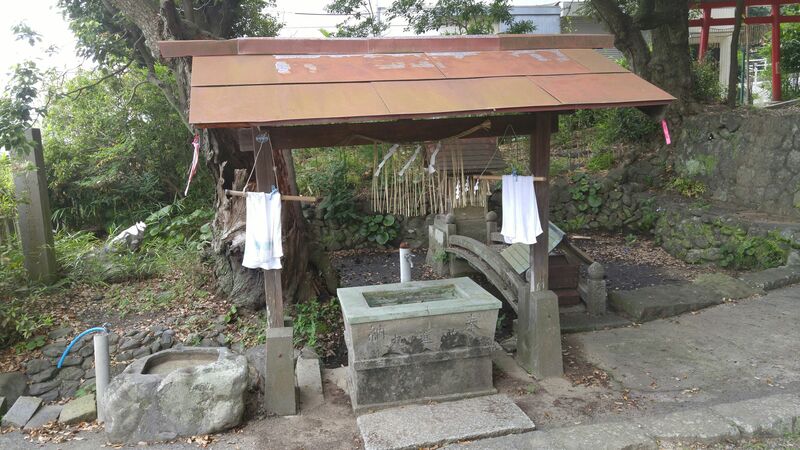 you will find on your left a simple, rustic stone hand wash basin with a small roof. 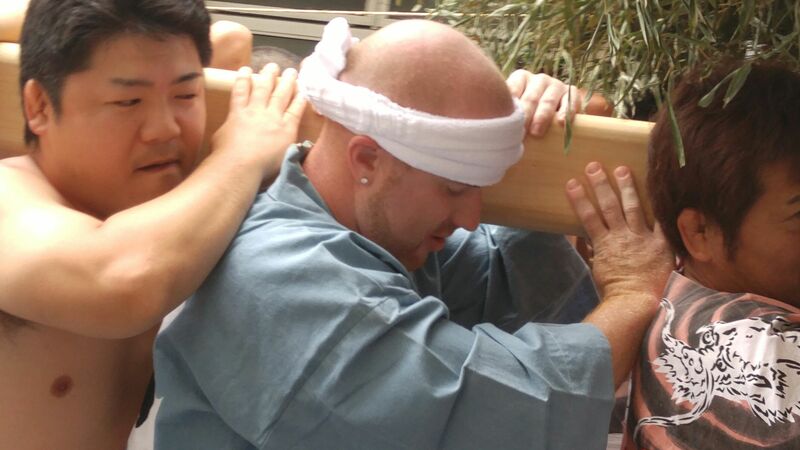 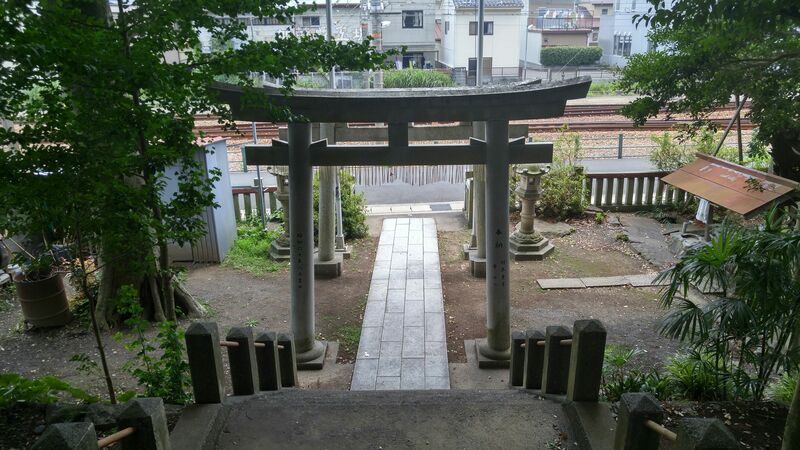 You will also notice another red torii ans small shrines on your left! 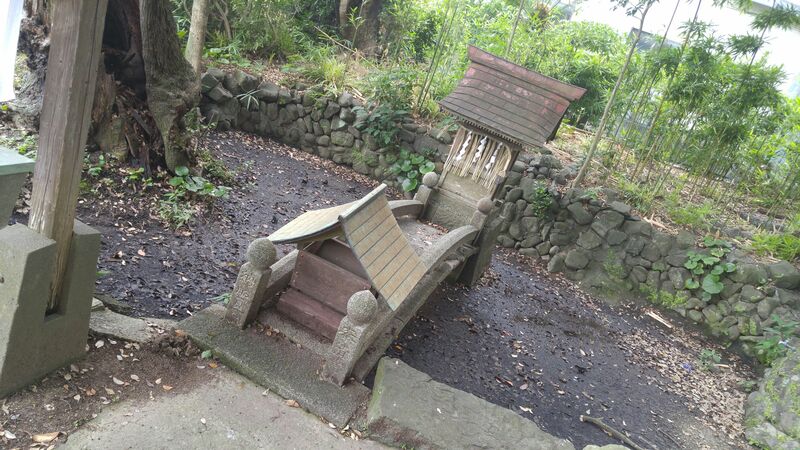 Past the stone hand was basin you will discover a tiny shrine spanning over what used to be a small pond! 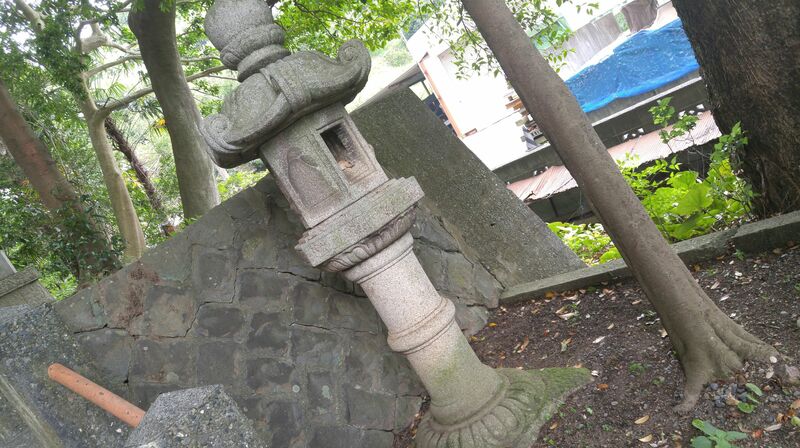 Many more stone lanterns beside the stairs! 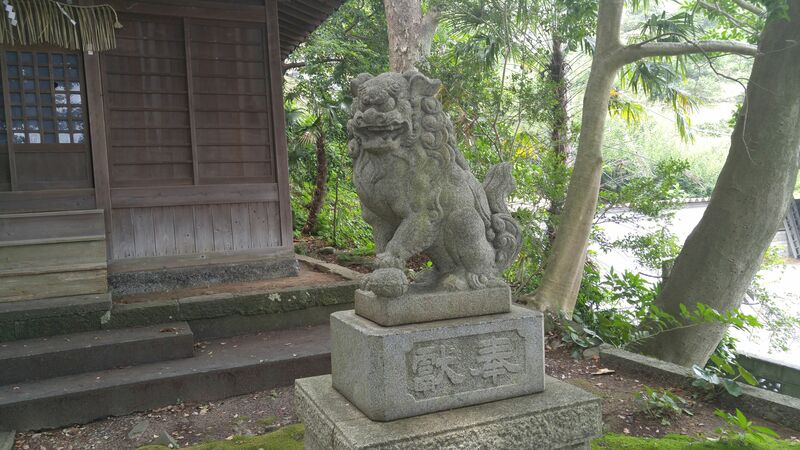 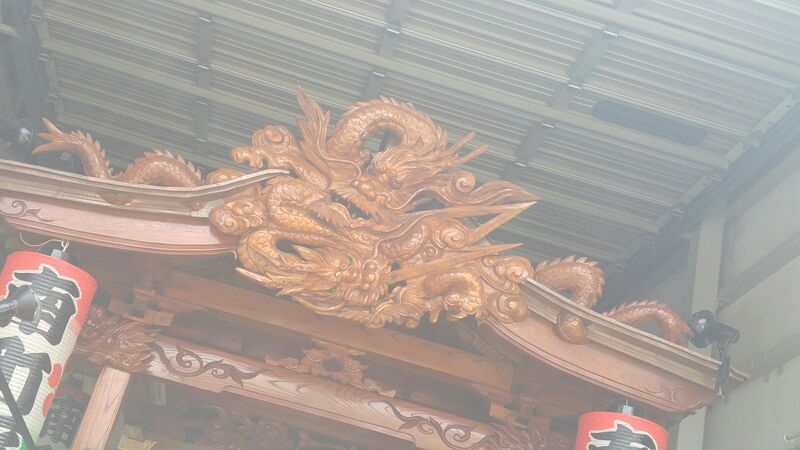 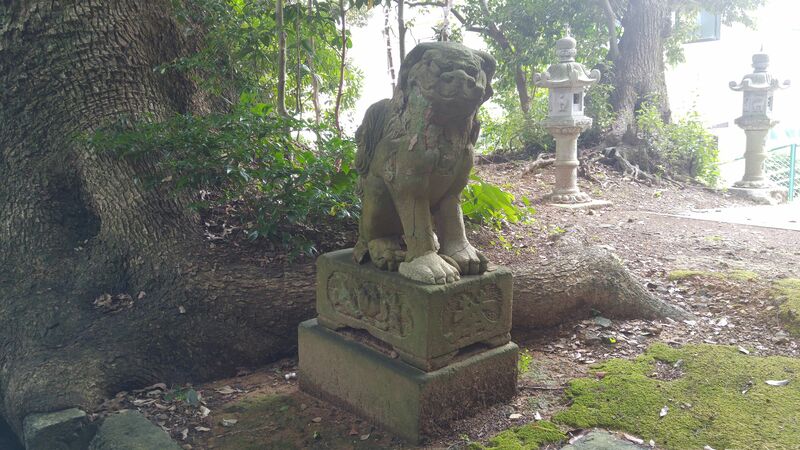 The shrine is guarded by two “komainu”/lion guards, the one of the left with its maw closed! 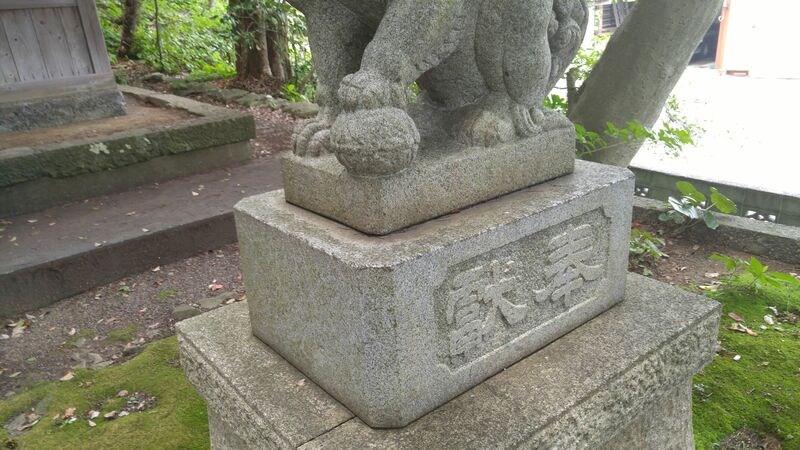 Its right paw resting on the back of a smaller lion. 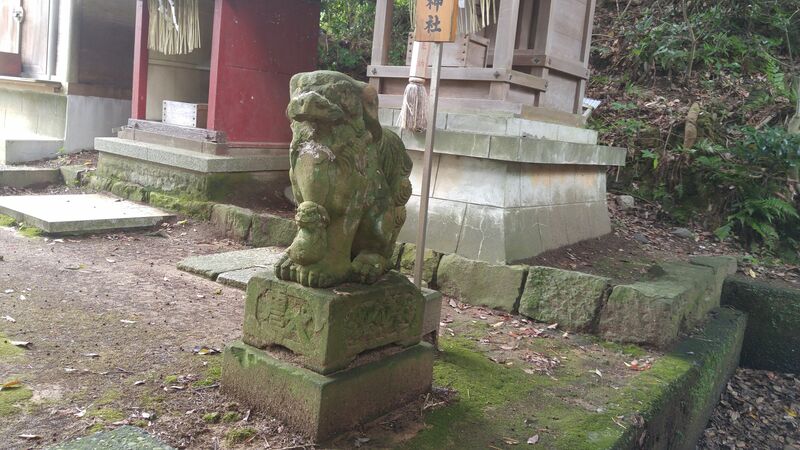 I’m still investigating the meaning of this smaller lion sometimes found in other shrines! 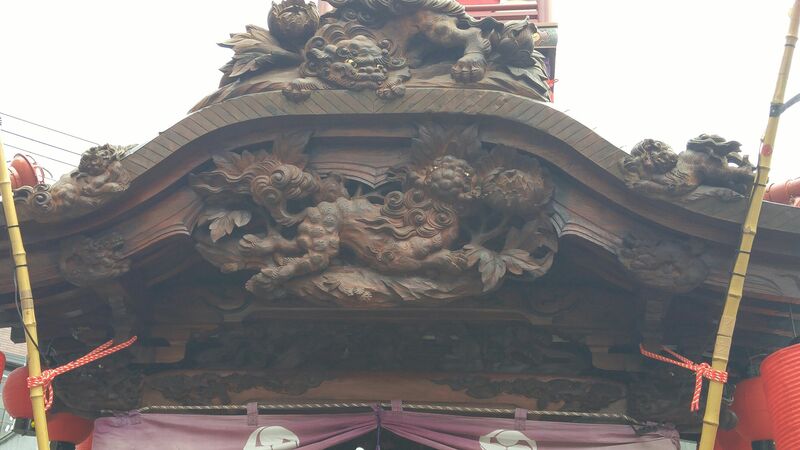 The lion guard on the right with its maw open! 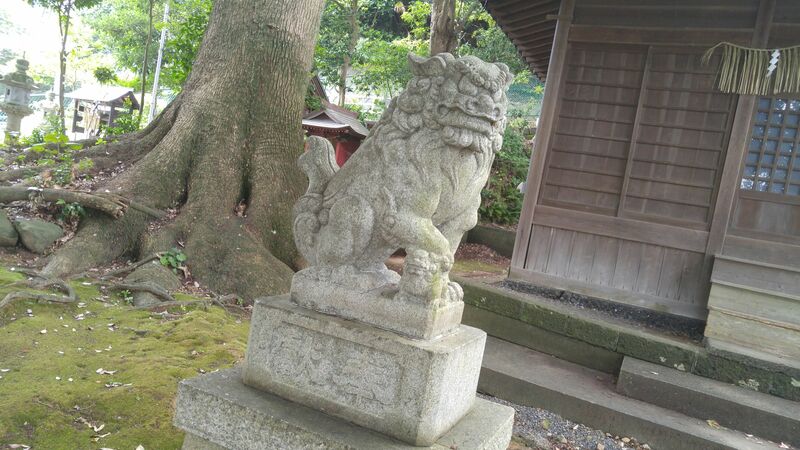 Its left paw resting on a sphere! 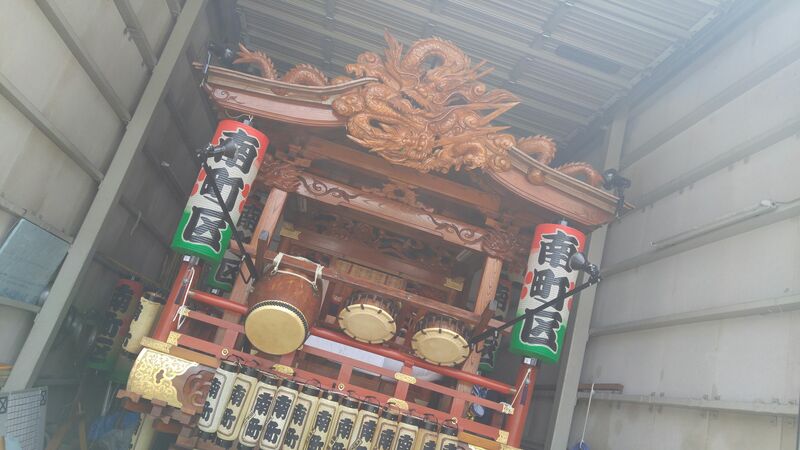 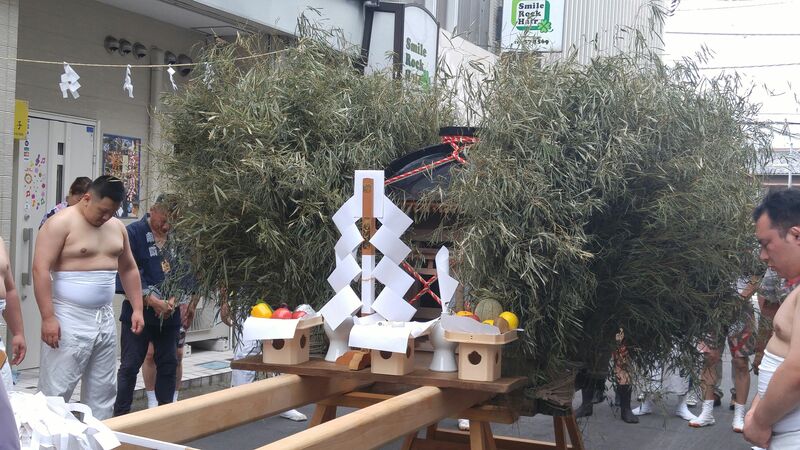 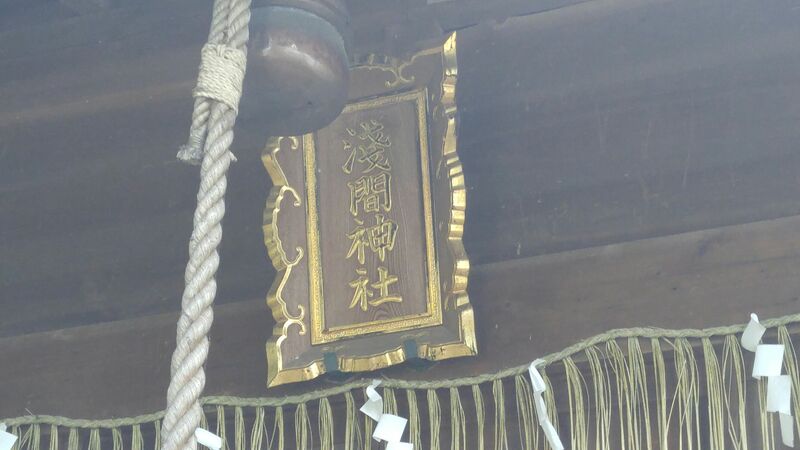 A closer view of the “haiden” with its praying bell rope! 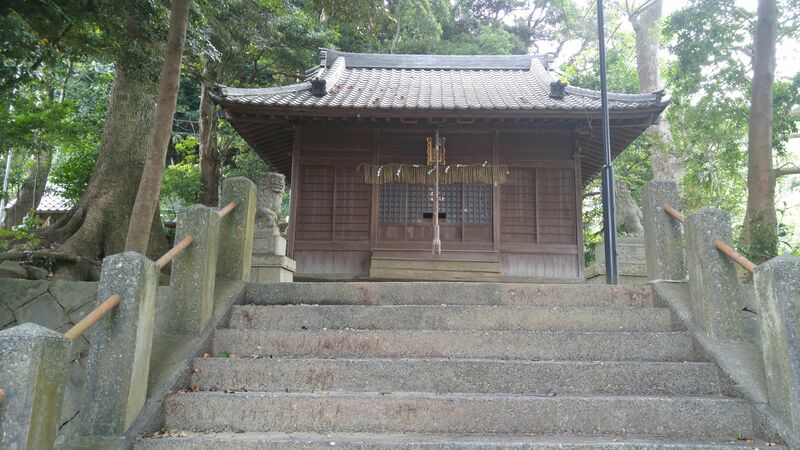 “Sengen Shrine/浅間神社”, one of the more than 1,300 shrines affiliated to the main Sengen Shrine at the foot of Mount Fuji in Fujinomiya City! 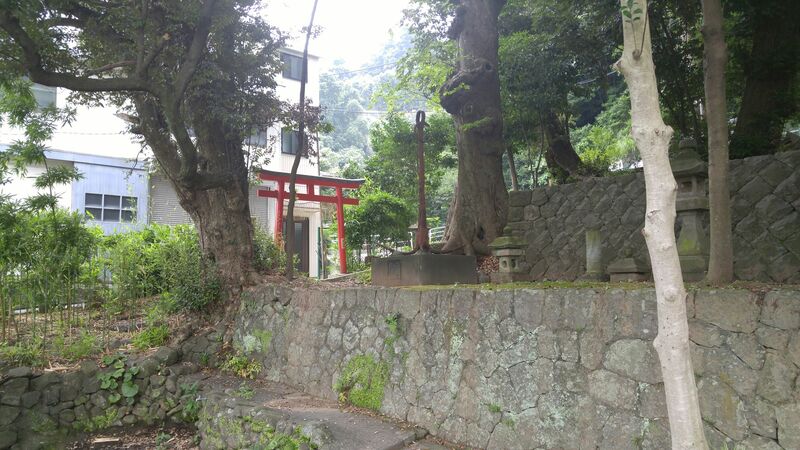 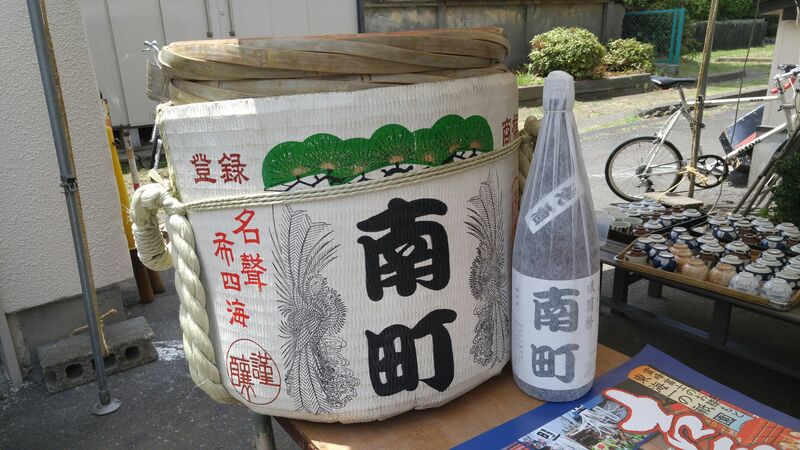 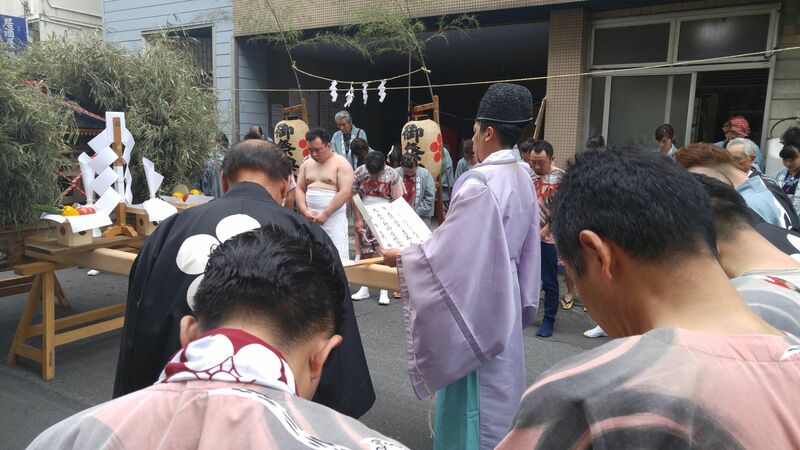 Let’s have a look at Kumano Shrine/熊野神社 on the left! 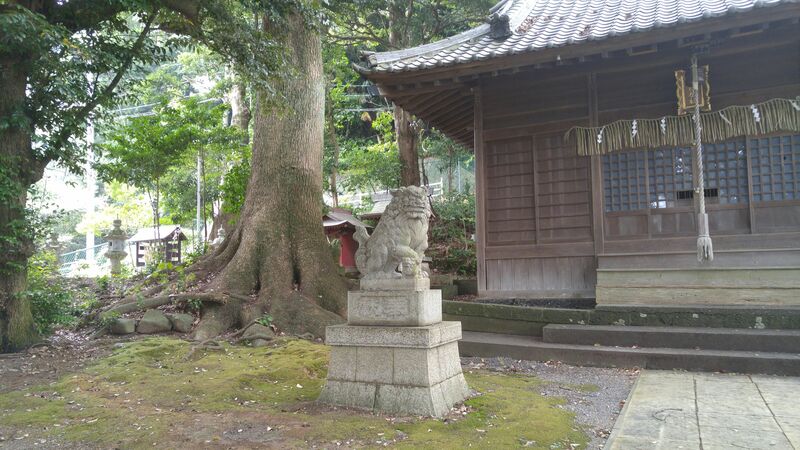 Guarded by two very ancient lion guards! 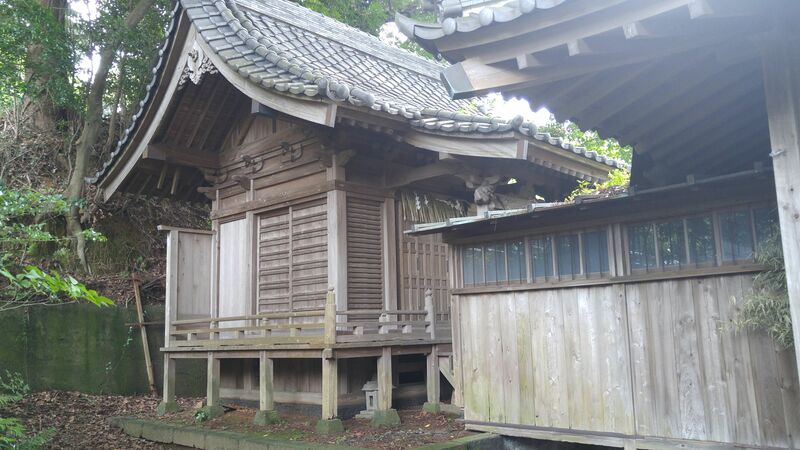 From there we can have a look at the “honden”/House of the god of Sengen Shrine closed to the public! 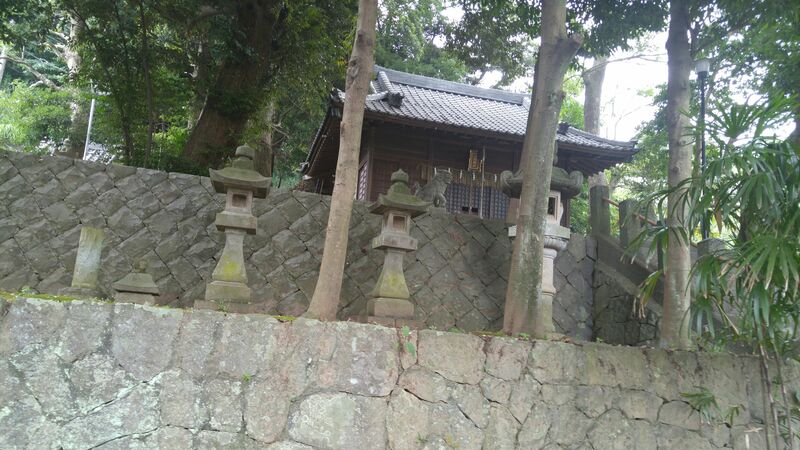 The side access to Kumano Shrine lined up with stone lanterns! 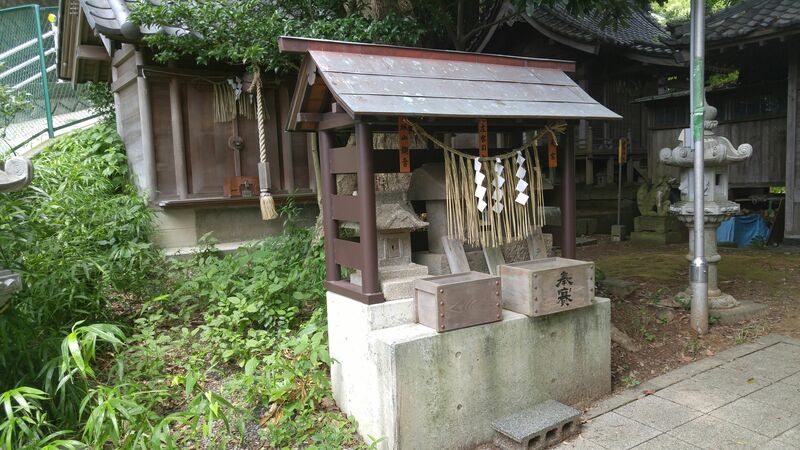 Actually it is more an association of small shrines, some of them with their own money offfering boxes! 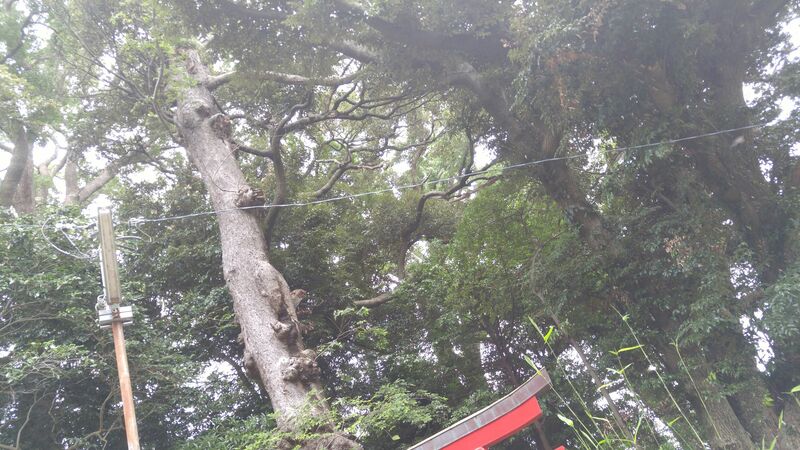 All under big old trees! 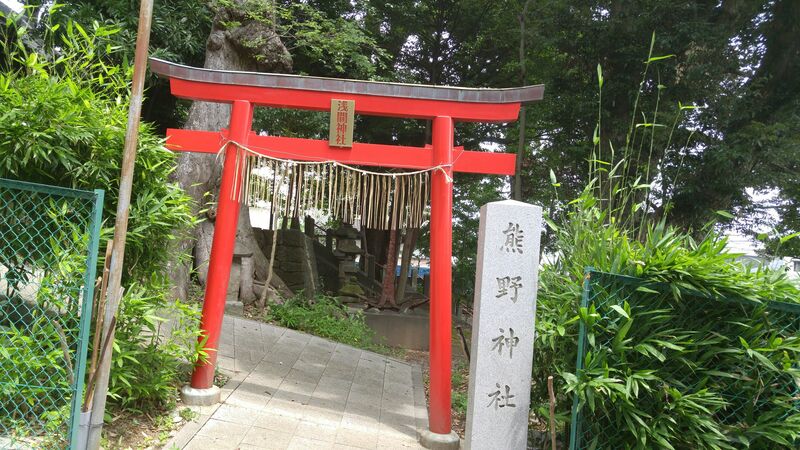 Although the torii plaque states “Sengen Shrine”, the stone is carved with the name of “kumano shrine”! 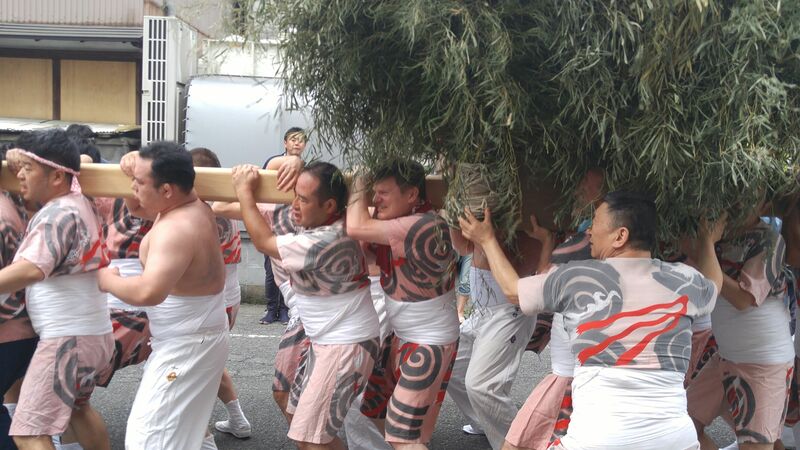 Dominated as usual by enormous trees which have seen a lot of puny humans along the years! 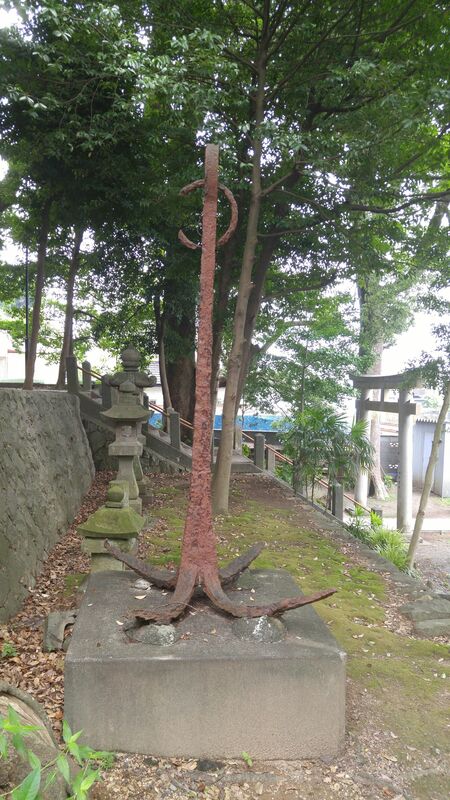 This anchor is the very proof that the site is dedicated to local mariners and fishermen! 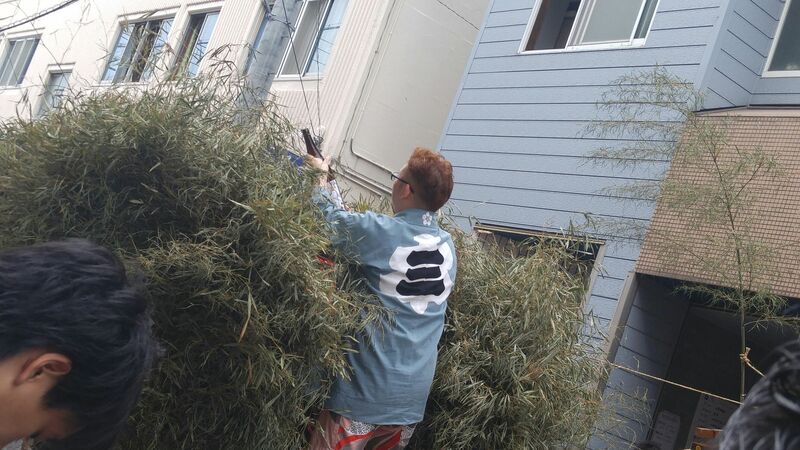 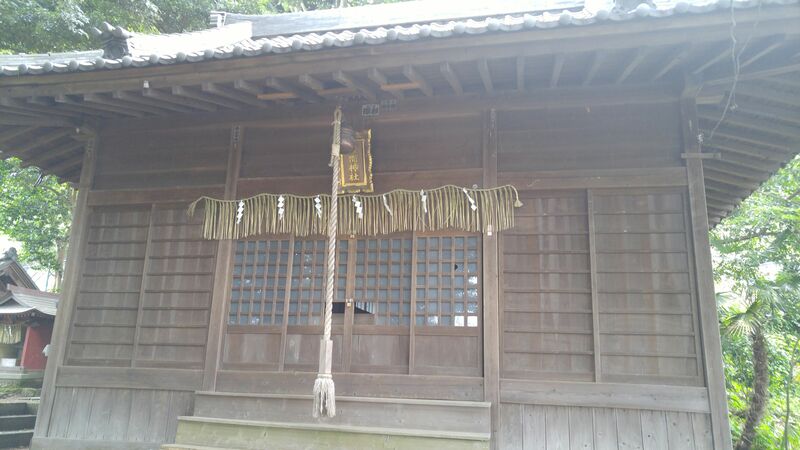 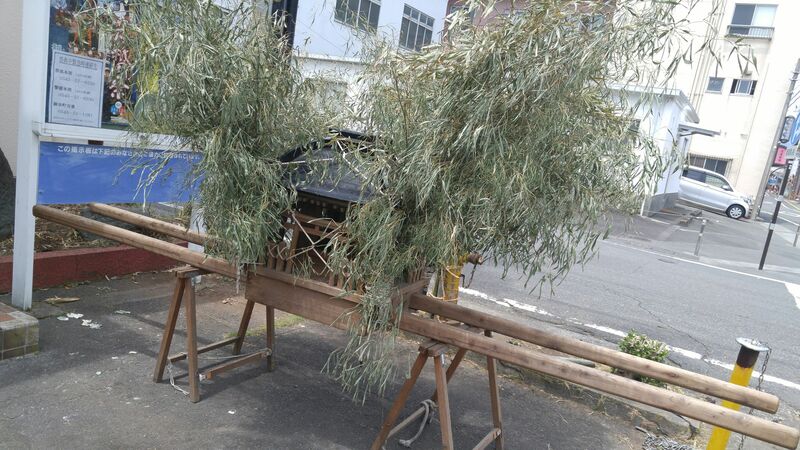 Good-bye, Sengen Sengen Shrine! 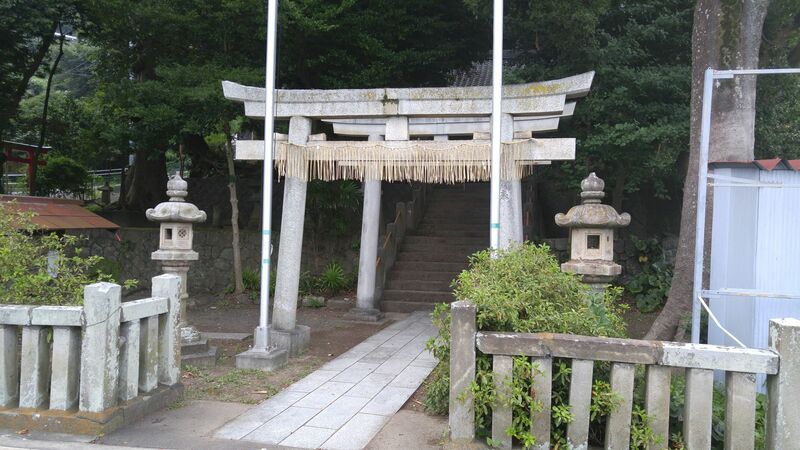 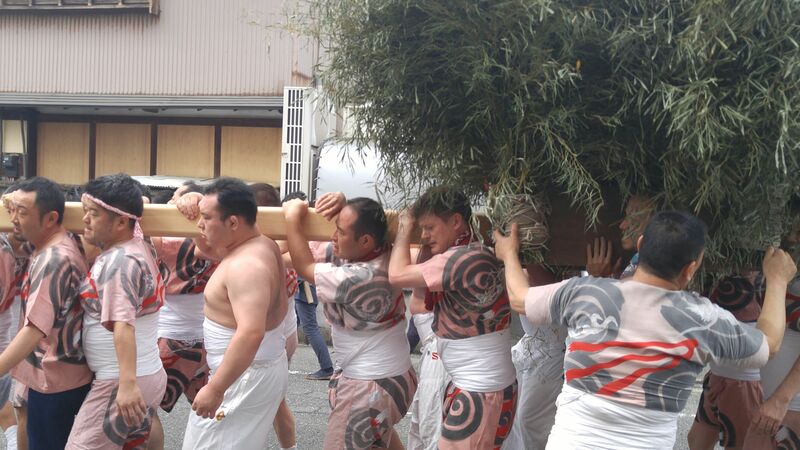 Good-bye, Kumano Shrine!